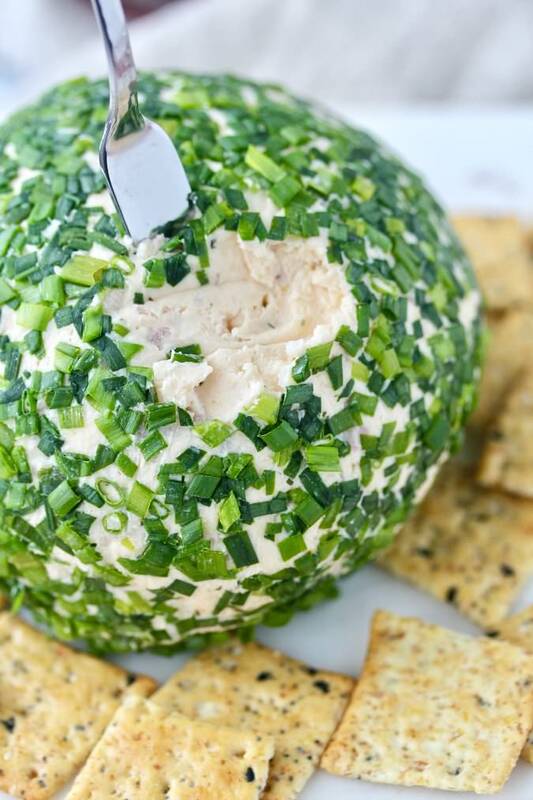 This cheese ball is is delicious spread on bagel chips or "everything" style crackers. This smoked salmon and cheese spread was a huge hit at work, where I shared it. I particularly love the havarti with dill. The "built in" herbs make this cheese ball extra easy to make. Cheese balls seem to be having a resurgence after having been deemed lowbrow for many years. Just because they were popular in the era of shag carpet, doesn't mean they shouldn't be loved for what they are. I'm beginning to see those iconic port wine cheese balls coated in almonds in the deli section of my supermarket. In fact, they have their own holiday, April 17. Go ahead, make cheeseball to celebrate. All you need to do is process all of the ingredients in your food processor, with the exception of the chives. Next, you form the mixture into a ball, wrap it in plastic wrap, and then chill it for about three hours. Finally, you roll the cheese in the chopped chives, and serve! You can make this up to two days in advance, making it an easy party appetizer. This month, the Fantastical Food Fight is all about cheese balls. Check out everyone's contributions. Add all of the ingredients except the chives to the bowl of a food processor and process until the mixture is smooth. This should take about a minute. Turn the mixture out onto a piece of plastic wrap and form it into a ball. Wrap the ball up with plastic wrap and refrigerate for 3 hours and up to 2 days. When ready to serve, place the chives on a plate. With your hands, shape it gently to even out any lumps or uneven parts. 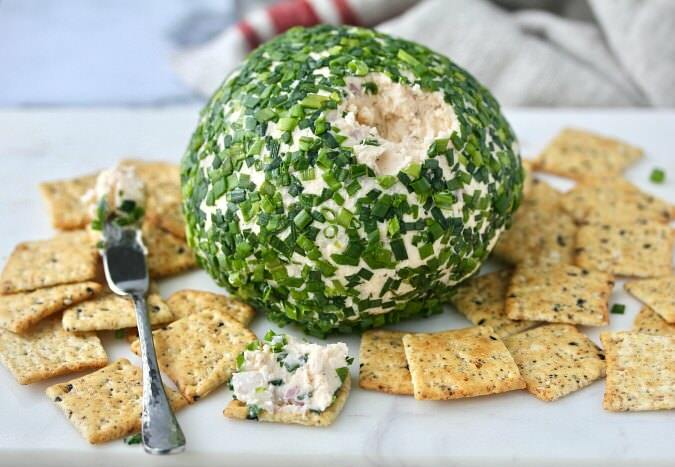 Unwrap the cheese ball and roll it in the chives to evenly coat. Set the ball on a serving platter and let rest at room temperature for 15 minutes and then serve with crackers, bagel chips, or crudités. This looks and sounds so decadent. It would be the perfect appetizer at a dinner party. 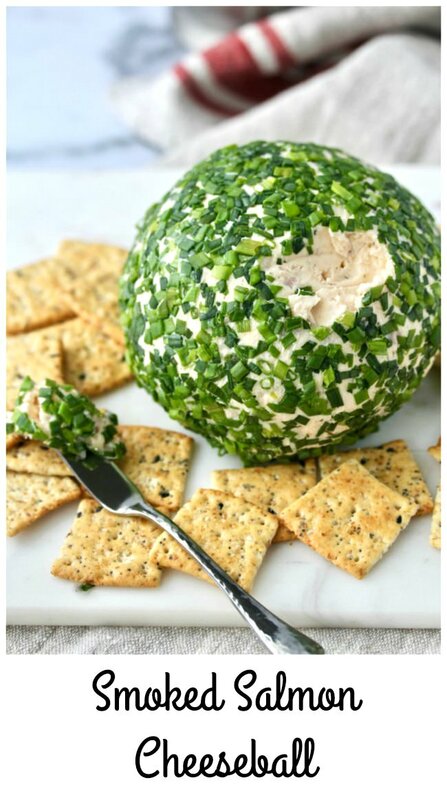 The chives on the coating gives a beautiful color and taste to the cheese ball, looks delicious. I was pretty happy with it. Thanks! This is so up my alley- I love smoked salmon and chives- leftovers on a bagel...so good! Dill Havarti and Smoked Salmon....what a great flavor profile. Thanks for sharing. This sounds so good, Karen! I really love smoked salmon and this is such a fun way to enjoy it. I bet it's delicious!